Harjit Singh Sajjan the 45-year old defence minister of Canada, gets 2,992 words in Maclean's, Canada's national weekly current affairs magazine. He i turban-wearing member of British Columbia’s Sikh minority, a community that has often attracted more than its share of bigotry from outside and been riven by more than its share of strife from within. Harjit Sajjan has an understated way of talking about his days combatting drug gangs as a Vancouver police detective or uncovering the secrets of Taliban networks as a reserve officer during three tours of duty in Afghanistan. But the voice of Prime Minister Justin Trudeau’s surprise choice as his minister of national defence takes on a tone of greater urgency when the subject is picking berries. Sajjan, now 45, came to Vancouver from a village in India as a five-year-old with his mother and sister, joining his father who had immigrated to British Columbia a few years before to find work in a sawmill. As the family struggled to get established, the way immigrant families always have, his mother made money by working through the summer months on the berry farms of B.C.’s Lower Mainland. Sajjan’s sister, now a Harvard-educated entrepreneur living in Seattle, still teases her little brother about how he played too much to be a good picker, and was too focused on eating the lunch their mother packed. “I whined about it for myself, but later I realized how hard my mom had to work,” he says. There were blueberries and raspberries at different stages in the picking season, but strawberries, which grow on lower bushes, were hardest to pick. “Either you’re on your knees or you’re sitting down,” he recalls. While Sajjan’s combat-zone and policing exploits seem to be what set him apart from most politicians, his experience with agricultural piecework may have been more definitive. “My generation, other friends I grew up with, a lot of whom are very successful now, we met berry picking,” he says. “We’re the only kids that wanted a longer school year and wanted it to rain in the summertime.” Wet weather meant the vans wouldn’t be coming that day to collect the pickers. To hear him enthuse about the benefits of immigration for Canada, and the near certainty of newcomers achieving the Canadian dream, it’s possible to imagine that his own path might have been—those early berry-picking mornings notwithstanding—a smooth rise to success. That hasn’t been the case. Sajjan is a turban-wearing member of British Columbia’s Sikh minority, a community that has often attracted more than its share of bigotry from outside and been riven by more than its share of strife from within. Sajjan talks of facing overt racism, particularly when he was training as a reservist in the Canadian military. As well, his entry into politics in 2014 as Liberal candidate in the Vancouver South riding revealed fault lines between Sikhs, although he says those tensions eased in 2015. He is one of four Sikhs in Trudeau’s cabinet—a remarkable contingent for a minority that represents only about 1.4 per cent of the country’s population. The others are Innovation, Science and Economic Development Minister Navdeep Bains, Infrastructure and Communities Minister Amarjeet Sohi and Small Business and Tourism Minister Bardish Chagger. Bains is arguably the most powerful of the four, as an insider in Trudeau’s circle and a key lieutenant in the retaking of dozens of suburban Toronto ridings from the Conservatives in the Oct. 19 election. Still, in the days after Trudeau named his cabinet on Nov. 4, Sajjan attracted by far the most attention. The main reason was that a photograph circulated showing the new defence minister in full battle gear during one of his stints in Afghanistan, grinning from behind wraparound sunglasses. Backing up that arresting image were details of glowing accounts from Sajjan’s military superiors, prompting social media to dub him the “badass” of Trudeau’s cabinet. His first deployment to the southern Afghan province of Kandahar was in 2006, when Canadian troops fought against fierce Taliban resistance in what was called Operation Medusa. Sajjan was on leave from his regular job as a police officer, and when he returned home, Brig.-Gen. David Fraser sent a letter to the Vancouver Police Department, praising Sajjan as “the best single Canadian intelligence asset in theatre,” and crediting him with saving “a multitude of coalition lives.” Not only was Sajjan brave, Fraser said, he had “single-handedly changed the face of intelligence gathering and analysis in Afghanistan.” Sajjan returned to Kandahar for another tour with the Canadian Forces in 2009, and then, the following year, was loaned to the U.S. as a special assistant to Maj.-Gen. James Terry, who was then commanding American forces in Afghanistan’s southern provinces. Sajjan says his success in Kandahar grew mainly out of his ability to talk to village leaders over countless cups of tea, patiently earning their trust. His turban signified something important to them. They knew he wasn’t a Muslim, but respected the “warrior culture” of the Sikhs. Sajjan was able to meet Muslim religious leaders who carry a great deal of authority and prestige in the district. As well, there was enough similarity between his family’s native Punjabi language and a dialect spoken in Kandahar for him to converse without translators. They came to trust him. “I don’t know how many times my life was saved and my soldiers’ lives were saved because I’d get a message [from a local leader] saying there’s going to be an ambush, or there’s going to be a suicide bomber, or you’re going to get hit tonight by mortar fire or something,” he says. Although Sajjan describes making sense of Kandahar mainly through a combination of street smarts and cultural sensitivity, he also kept up on academic research. In early 2007, he sent an email to Barnett Rubin, perhaps the leading U.S. expert on Afghanistan, and author of several books, including most recently Afghanistan from the Cold War Through the War on Terror. Sajjan had read an article by Rubin in the journal Foreign Affairs called “Saving Afghanistan,” and passed along his own assessment about what to do about Afghanistan’s opium economy and its connections to state corruption and Taliban financing. Although he was only five when he left Bombeli for Vancouver, Sajjan’s memories are vivid. “We were a farming family,” he says. “We ate what we grew: wheat, corn, sugar cane. Different vegetables for making dinner.” He remembers his grandmother carrying huge bundles of fresh-cut fodder for their animals on her head. They owned three oxen, two that worked, and a lazy black one that preferred following around a little boy. “People had pet dogs, I had a pet ox,” he says. There was no plumbing in their house; they fetched water from one of the village wells in clay vessels. Meals were cooked over an open fire. He and his sister went barefoot most of the time, not because they were too poor to own shoes, but because they preferred it. As he was entering his early teens, Sajjan says he was an indifferent student. He came to a turning point. He credits a Grade 9 social studies teacher with encouraging him in his school work and instilling new confidence. It happened the teacher was also a naval veteran, and spoke inspiringly of military service. While he grew more focused in the classroom, Sajjan also decided to start wearing the turban and following a more strict form of Sikhism. “I needed a commitment to stay out of trouble, including alcohol and other things,” he says. His parents didn’t push him in that direction, he says, although his father was a prominent member of the World Sikh Organization, which is widely identified with a traditional form of the religion. He graduated as the top candidate from his class. Instructors had gradually eased up on him when he outworked his peers. “If you just perform, it’s the best way to change somebody’s viewpoint,” he says. His commanding officer suggested he continue on to officer training, which led him to Gagetown, N.B., and later to bases all over Western Canada. Returning home, he decided against a full-time military career. Instead, he joined the Vancouver Police Department, which assigned him to his familiar South Vancouver neighbourhood as his first patrol in the summer of 1999. “I loved it,” he says. “You can make a difference every single day.” He was settling down, having married a University of British Columbia medical student in 1996. Dr. Kuljit Kaur Sajjan now has a family practice in Vancouver. Sajjan says they haven’t yet decided how to organize their family life, with their two young children, between Vancouver and Ottawa. Having already taken two leaves of duty from the police force to serve in Kandahar, Sajjan had to resign to accept his assignment to advise Gen. Terry for a third stint in Afghanistan in 2010. He returned to take up the position of commanding officer of the British Columbia Regiment, although still as a reservist, rather than a regular soldier. Asked about how he began the transition to politics, he is circumspect. By the winter of 2014, however, Trudeau’s team was making a point of showcasing Sajjan at a key Liberal policy convention in Montreal. Late that year, with their backing, he won the Liberal nomination in Vancouver South, after former Liberal MP Barj Dhahan, a prominent businessman and a pillar of the B.C. Sikh community, withdrew from the race. Their rivalry was reported in Vancouver as pitting fundamentalist Sikhs who backed Sajjan, including World Sikh Organization members, against non-turban-wearing moderates, who lined up behind Dhahan. After his victory over a Tory incumbent in Vancouver South on Oct. 19, Sajjan’s name circulated in cabinet speculation. However, another rookie MP, retired general Andrew Leslie, who had won an Ottawa seat, was more widely touted as a likely defence minister. After all, Leslie had commanded the army in which Sajjan merely served. If Sajjan is daunted, he doesn’t show it. “I have a deputy minister and a chief of defence staff,” he says. “I have full confidence in them.” Yet he faces tough early decisions. Foremost among them is how to fulfill the controversial Liberal campaign promise to withdraw Canadian fighter jets from the U.S.-led coalition bombing Islamic State terrorists in Iraq and Syria. Trudeau has pledged to instead boost Canada’s contribution to training Iraqi forces for that fight. Already, though, Canadians advising local Kurdish forces in northern Iraq have been involved in combat. 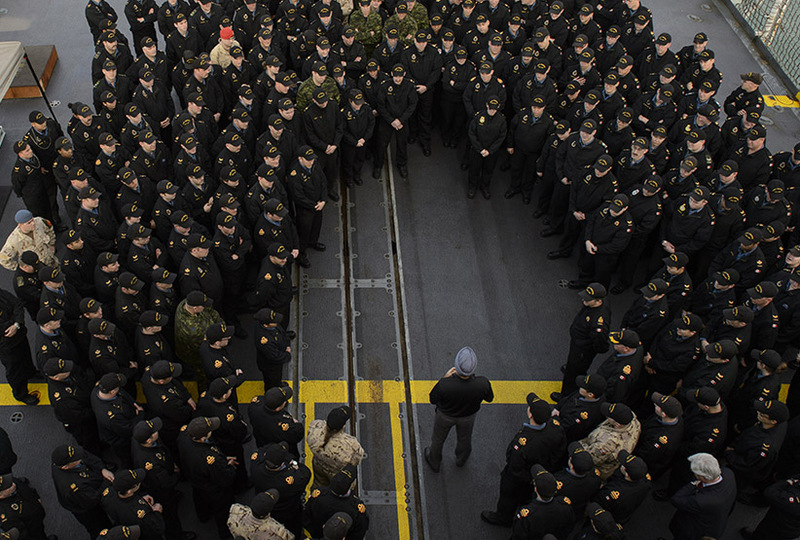 Would an expanded training mission inevitably mean bringing Canadian troops more into harm’s way? As he ponders the alternatives, Sajjan says he views the options through the lens of his own experience. “It does give me a unique perspective,” he says. He means, in this case, his experience in combat zones. 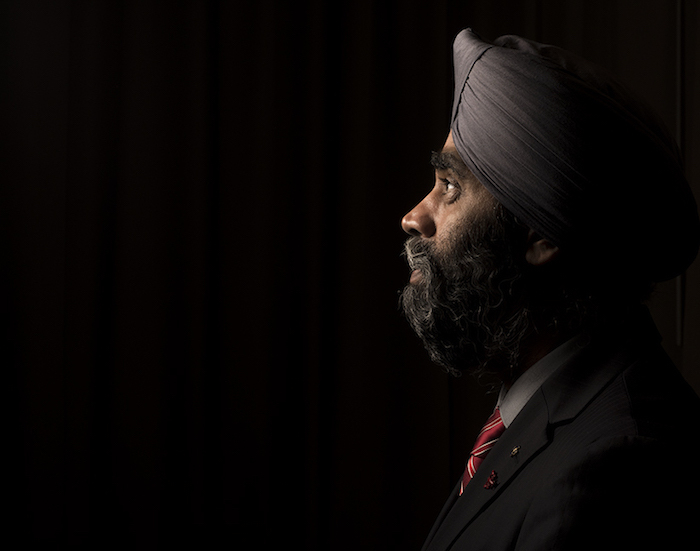 But given his background—from berry picking, to overcoming bigotry, to battling criminals and insurgents—Sajjan’s perspective is unique in many ways. If that first glimpse of him in a snapshot piqued our interest, it’s the layers behind the sunglasses and beneath the camouflage that make Sajjan a figure to watch as the Trudeau era unfolds.